Greater Vancouver, B.C. – British Columbia’s premier recreational vehicle show is once again returning to Tradex – Fraser Valley Trade and Exhibition Centre from February 14 to 17, 2019. Just in time for Christmas and for the first time, the Show is offering an online ticket sale option for those who want to plan their attendance now and maximize their time spent at the RV Show in February. To buy tickets online, visit: http://www.rvshowsbc.com/earlybird/. The Earlybird RV Show & Sale is Greater Vancouver’s one-stop resource for those looking to plan a family getaway, road trip or even just a weekend getaway. Catering to all different needs and lifestyles, the show has answers for those just beginning to plan their RV journey or RV veterans who have an abundance of mileage under their belts. The annual event holds the reputation of being the foremost event of its kind, showcasing informative travel seminars, and the latest in RV trends and products, including the newest and best RV models. From private sales and dealer displays to a wide variety of booth exhibitors, there’s over 150,000 square feet for you to explore. Your next adventure should begin at the 2019 Earlybird RV Show! 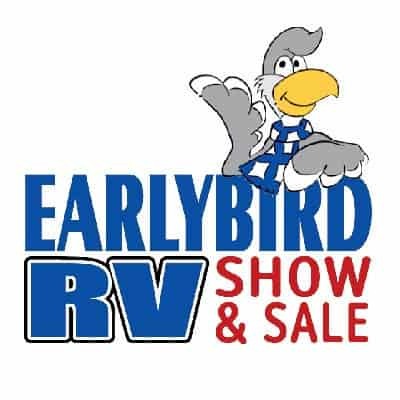 The Earlybird RV Show and Sale will provide everything you need to get on the road this season! Net proceeds will be donated to charity; both Earlybird and Snowbird RV Shows to date have raised over $1.7 million.